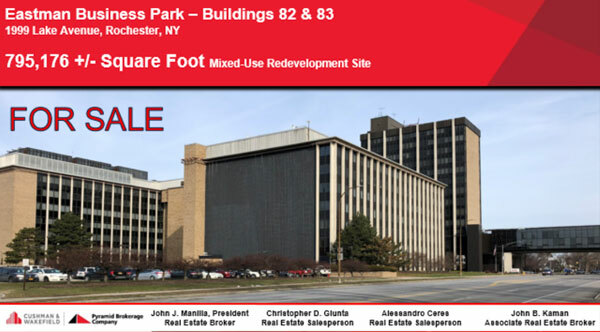 John J. Manilla, Christopher D. Giunta, Alessandro Ceres, and John B. Kaman have been retained to exclusively represent the sale of 1999 Lake Avenue, Buildings 82 & 83 of the Eastman Kodak Park. This is a unique opportunity to purchase a high profile property featuring a mix of office, labs, and R&D and meeting space with corporate HQ presence. This property benefits from the amenities and services offered through the Eastman Business Park. The Eastman Business Park Campus is a 16,000,000 square foot manufacturing complex situated on 1,200 acres adjacent to the subject property. Located immediately across from AIM Photonics.